What does the Shroud of Turin mean? Why does Mel Gibson's movie about the crucifixion ignore the findings of sindonology? There is no question that Mel Gibson's The Passion of the Christ is the most important religious movie in years. Though spattered with more blood than a Quentin Tarantino epic from violence equally as exaggerated, the film has rightfully earned high praise for its cinematography, casting, and above all, sincerity. It is that earnestness in recounting the tale of the arrest, torture, and execution of Jesus that has attracted the millions of Christians who have flocked to spend their coins on it. With only Latin and Aramaic spoken throughout and looking like an antique Italian holy card, the movie is assumed by many to be as accurate a portrayal of the events as could be depicted. Even the pope, it was said, had given his blessing. "It is as it was," John Paul was claimed to have mumbled in approval after viewing it, though the Vatican denied those words as hastily as Peter. Yet, even a cursory watching of the film will reveal that the details of the crucifixion do not match those garnered from the Shroud of Turin. Indeed the images, though more brutal even than the exercises of the Penitentes, are straight out of the most pathological medieval imaginings of the ordeal. The story itself is not just cobbled together from the Gospel accounts. Take note: The Passion of the Christ is thoroughly imbued with extreme, conservative Roman Catholic piety. Material is incorporated from the visions of a stigmatic German nun of the 19th century, the Venerable Anna Emmerich, along with incidents popularized in Catholic devotions such as The Way of the Cross and the Sorrowful Mysteries of the Rosary. These scenes emphasized the role of Jesus' mother Mary in his torture and death to the point where she could be considered a fellow savior, or "co-redemptrix" a doctrine as yet formally unapproved by the pope. And the last groups he thanks in the credits are the extremist Legionaries of Christ, whose founder has been disgraced by charges of sexual abuse, and the Jesuits. 'Nuff said. Whether or not one believes the Shroud is real  and the evidence continues to mount that it is  it is a fact that interest in the Shroud has spawned much scientific and historical research on crucifixion. Literature has been examined, corpses have been nailed up, volunteers have been smeared in blood and subjected to indignities. Even during the Holocaust, horrific Nazi "experiments" performed in the camps gave insights into how long humans could endure being suspended by their arms. Thus, today, we know more about the techniques of crucifixion than anyone since the undeniable masters of the technique, the Romans, finally put their hammers down around A.D. 315 after the conversion of the Emperor Constantine. And the way it is depicted in Mel's movie, though rigidly traditional, is simply too extreme. Crucifixion is bad enough by any standards, but this is almost pornographic comic-book ultraviolence, frankly. Blows: The savage beating begins at the moment of arrest, so that Jesus appears before Pilate with his right eye already swollen shut. It continues afterwards; he is knocked down repeatedly, a one point hanging upside down over a bridge. Blows: Swelling on cheek, nose, and lips indicate at least several hard blows to the face. The Gospels do say he was struck by Roman soldiers during the crowning with thorns. Scourging: Excessively brutal, and would have been fatal from shock and bloodloss alone. Romans begin with 30-40 vigorous strokes from canes. Having warmed up, they then switch to a couple of multi-thonged whips complete with hooks and get serious. Once finished flailing on Jesus' back, they partially release him so they can lash the front of his body. The flogging continues until a tardy intervention by an officer, but by then the soldiers are exhausted anyway. Scourging: Marks on the back and legs of the Shroudman indicate the use of a Roman flagrum, like a cat-o-nine-tails with small dumbbell shaped pieces tied on the ends. These broke the skin but did not flay it from him. The pattern of the welts indicate two tormentors, possibly of different heights. Tradition permitted 39 lashes  40 to fulfill the law, less one to show mercy. There are 120 or so impressions. Crowning with Thorns: The crown is several nasty looking branches with two-inch-long thorns rolled up like a wreath, much as is usually shown. Crowning with Thorns: There are puncture wounds surrounding the head  not just on the sides but across the top as well. True royal crowns in that era, we are told, were much more like caps than circlets. Carrying the cross: The two thieves get fairly hefty crossbeams. Jesus gets the whole works, of course, and his is especially large, looking like it was hewn from a Ponderosa pine or something. Calvary is no little hill either, more of a mountain across a gorge from Jerusalem. Plus, unlike other depictions, there is iron hardware on the ends of the beams for some reason. Carrying the cross: Abrasions on the shoulders indicate that only the crossbeam was carried, as was likely the typical practice. Men carrying such a beam found that the easiest way would not have been across the shoulders but pointed forward. It should be balanced with the arm draped over the front and the major portion hanging over the back. This matches the placement of scrapes on the upper back and shoulders of the man on the Shroud. Falling: Catholic tradition usually shows him falling down three times on the way, each time more severely. The movie shows at least twice that number, and most are full, keeling-over pratfalls  with the cross landing on top for added measure. Falling: Shroudman had fallen several times, according to the injuries shown on his elbows and knees. Stripped: As one might expect, Jesus gets to keep a modest loincloth. Bored, the Romans gamble over his robes, which are torn, bloody rags by this time. Stripped: Shroudman was completely naked, the humiliation and exposure to the elements being part of the punishment. Nailing the hands: The nails are graphically and gruesomely shown being pounded into the center of the palms. (By the way, the hand holding the spike is supposedly Mr. Gibson's.) The blood also drips along the nail and out the back of the cross, which would be most unlikely. Nailing the hands: The most obvious difference between the Shroud and the traditional view is that on the Shroud the wounds are on the wrists and the thumbs are not visible from the back of the hands. Experiments with cadavers have shown that due to the weight of the body, nails would rip out through the flesh between the fingers. But placed through the hollow just beneath the wristbones, the nail could support the weight  plus it would pull the thumb in towards the palm. Ropes, of course, could have helped secure the victim, and are used in many movies, but there is no sign of rope-burn on the arms of the Shroudman. Nailing the feet: Shown in the traditional manner through the tops of the feet onto a little footrest. Whether this was a mercy or not depends on whether one considers prolonging the agony good or not. Death by crucifixion usually came slowly from asphyxiation as the victim had to haul himself up painfully against the nails to breathe. Nailing the feet: The only remains of a crucified person ever found in the Holy Land has a single nail through both the heels of both feet that hadn't been extracted as it had bent. He would have to had his legs turned to the side as in The Last Temptation of Christ. Shroudman was nailed through the tops of the feet. It appears that the left foot was placed over the right and two nails used. Erecting the cross: First the soldiers flip it over unecessarily to pound the points of the nails down. Apparently they weren't using Acme (TM) nails and were afraid he would escape. Seriously, why would they make it harder to take the body down afterwards? More gratuitous violence. Erecting the cross: The crossbeam would likely have a mortise or notch on the bottom. Once he was affixed, the beam would have to be hauled up and lifted over a tenon in the already-standing upright. This would result in a T-shaped configuration. According to the Gospels, however, there was a placard placed above Jesus, so perhaps the upright continued above the crossbeam as it traditional. The Shroud offers no evidence either way. Stabbed in the side: A Roman does so with a broad-headed spear, and Jesus' blood sprays out like a fire hose, even though he supposedly just died. Stabbed in the side: There is a wound on the side. A spear thrust in such an upward direction would pierce the sack around the heart and release serum along with blood. There is a large stain next to this wound on the Shroud. There is some blood but it appears mostly to be from a clear liquid from the pleural sac surrounding the heart. Once again, just as the Gospels say. Buried: The body is wrapped in a cloth once it is taken down. According to Anna Emmerich, the shroud was given to the Marys by Mrs. Pilate, but in the movie the mother of Jesus apparently uses it to clean some of the divine gore off the whipping floor. Buried: The body was washed and anointed, carefully laid out on the bottom half of the Shroud, surrounded by flowers, and the top laid over it. Raised: A very dramatic, brief scene with light streaming into the tomb. There is a glimpse of the plain, clean burial cloths settling and a naked Jesus with a hole through his hand. He looks stern, almost as if he's contemplating the sequel, "The Passion of the Christ II: Yeshua's Revenge". Raised: This is the big question. 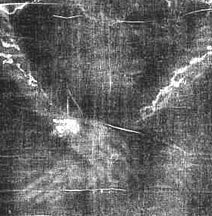 The recent discovery of a matching image of the face on the other side of the cloth is possible further evidence of some kind of energy discharge. Other criticisms can certainly be made of the movie. Some scenes seem suggestive of a strange theology concerning the devil. Satan, played by a woman, is a curiously androgynous figure lurking about, and does not seem sure of what Jesus is up to. Interestingly, Satan is most clearly seen by Jesus' mom, and appears after the scourging, tenderly holding up an ugly, baby-like dwarf (possibly one of the devil kids who tormented Judas to suicide earlier). Is this a reference to the Antichrist or what? Later, when Jesus dies, there is a quick shot of Satan, foiled again, writhing alone in Hell. Too bad that Gibson did not use Emmerich's technicolor vision of the Harrowing of Hell, but his special effects budget might have been limited. Now that would be an action picture! Oh, and when Pilate tells Jesus that his own people have turned him over, the Latin word used sounded to me like "pontifice"  "pope". Was the Jesuit translator having a little fun? But why would it matter how it relates to the Shroud, some might ask. 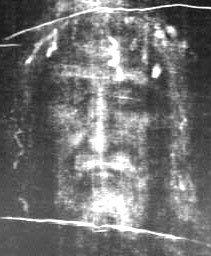 Hasn't the Shroud of Turin been shown to be a fake from the Middle Ages? 1. The Shroud is from the first century. It is composed of a herringbone weave and stitching found in first century or before. The stitching was discovered quite recently by Swedish textiles expert Dr. Mechthild Flury-Lemberg. The scientific protocols were violated from the start. The labs responsible for the testing knew exactly which scraps were from the Shroud and which were not. The sample was taken from the most handled portion of the Shroud, apparently from a patch from the fire in the 16th century. Carbon-14 dating works best when done on objects found in situ as the results can be seriously skewed by contamination. Apart from all the physical handling, Shroud has been scorched and burned in places several times in its history. 2. The Shroud is not a painting, but is something like a photograph. The very first photograph showed that it possessed the characteristics of a photographic negative in the reversal of light and dark. Such was completely unknown before the invention of photography in the 19th Century, and unlikely to be thought of by a painter  even Da Vinci. If the boiling in oil could not "remove the markings" then it was unlikely to have been painted with any pigment known in the Middle Ages. In fact, examination has revealed no layers of pigment, nor stroke marks like paintings. A superficial amount of ochre that has been found could well have been from painted copies being held in contact  a common practice with medieval relics. Image processing with sophisticated military computers revealed that the Shroud contains 3D information like hologram. In other words, the image intensity varies with the distance the cloth was from the body. No painting can accurately duplicate this effect. Microscopic examination reveals that the image is similar to a scorch. It is a faint discoloring of the topmost fibers, and does not even penetrate through a single thread. 3. The dark stains on the Shroud prove it was from a real crucifixion. The blood flows down the arms show that the man was suspended by his wrists. The difference in the trails indicate two positions due to the necessity of having to pull himself up to breathe. They also show that he generally kept the right arm bent and the left straight. The stains are demonstrated to be from human blood, type AB. A pigment in the bloodstains, bilirubin, reveals that the person was under severe traumatic stress, and the serum stains indicate that the cardiac sac was punctured, which would be ultimately fatal all by itself. 4. Distortions in the image indicate the man was not laying down flat. The head is very slightly forward, the back curved, and most obviously, the legs are bent with the knees raised. Some have argued that this indicates the man was on comfy cushions, and therefore alive. However, in that case the image would logically be uniform along the entire back, which it is not. It is more likely that the posture is due to the onset of rigor mortis some time after death. Since rigor mortis works from the furthest extremities up, the legs would be the most affected parts. 5. The man on the Shroud was deceased. Aside from the evidence of rigor mortis, the large watery stain indicates that the pleural sac surrounding the heart had been pierced, and that the man was really most sincerely dead. 5. There are other images on the cloth which indicate it is not a vaporgraph or similar kind of image. A vaporgraph is a chemically-produced image. It would have been made by the interaction of the sweat, blood, aloes, and myrrh and the heat from the cooling corpse with the cloth. However, there appear to be small coins on the figure's eyelids, and hundreds of flowers, all common to the Near East, scattered around the body. They would not show up in a vaporgraph. Moreover, the most similar images that have been created required the warmth of a living body. 6. The Shroud was in Jerusalem at one time. Pollen found among the threads comes from the Jerusalem area. Along with pollen from Turkey, France, and Italy, attesting to its later travels. 7. It precisely matches the Sudarium of Oviedo, said to be the cloth that covered Jesus' face. Though it does not possess the image of a face, the Sudarium is of the same kind of cloth, and the bloodstains and type match. It too has pollen from Jerusalem, but also from Egypt and Spain, indicating a different journey. Also, its history is well documented from before 700 A.D. Thus, the enduring enigma of the Shroud, and the mystery of its image. It shows an actually-crucified man. Could it have been some unknown Penitente, like the fellows in the Philippines who do it publicly every year, or the notorious sect in New Mexico that continued secretly nailing up people into the early 20th Century at the least? No, because they always carefully follow traditional Catholic iconography: nails through the palms, the crown of thorns like a circlet rather than a cap. Whoever it was, then, had to have been crucified in Roman times. The only one known to have been so executed with a crown of thorns is Jesus. The image, too, is unique. There is nothing like it in the entire world. Nobody has ever been able to accurately reproduce it. The recent discovery of an even fainter matching image of the face on the other side of the cloth, likewise a scorch only a few fibrils thick, argues strongly that the image was formed by a brief, powerful burst of energy. The kind that might be involved with, say, a resurrection? The man on the Shroud has no navel. 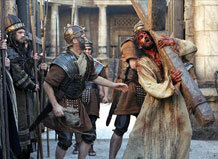 All images from The Passion of The Christ Copyright &COPY; 2003 Newmarket Films All Rights Reserved.